Reference number for this case: 22-Oct-54-Scherlenheim. Thank you for including this reference number in any correspondence with me regarding this case. In 2004, the journalist Christian Valentin published a detailed article on the Alsatian case of "flying saucers" that took place during the great wave of 1954 in France. He reported that on October 22, 1954, at 09:00, p.m., in Scherlenheim, a 15-year-old young man saw a luminous craft from his garden. He ran to get his father's gun and shot it down. 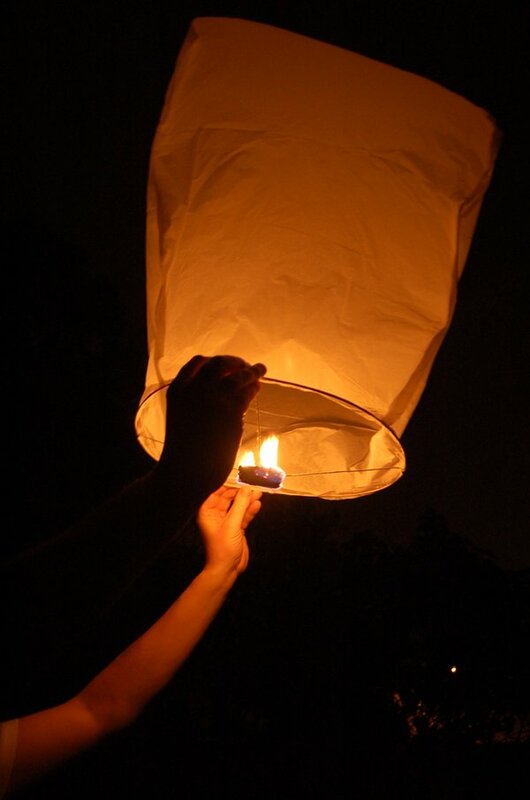 The object fell to the ground, and the young man found it was an ordinary rubber balloon with a paper lantern using a wax candle. In other words, modern word: a Chinese lantern. Since I published this negative case with its explanation on my website in 2005, no less than three other website copied it but omitting all the parts if my file that provided the explanation. The journalist reports that on October 22, 1954, at 09:00 p.m., in Scherlenheim, a 15 year old young man saw a luminous machine from his garden. He ran to get his father's rifle and shoot at it. The object fell on the ground, and the young man found that it was an ordinary rubber balloon with a paper lantern using a wax candle. This French-speaking web forum copied my web page that lists the cases of the 1954 French flap. So this case appears there so but the reader cannot access my file showing that the case is negative because the link to the file was removed. There is a link to the page of my site that lists the 1954 French cases, but this link is pointing to the old address of my website so that the page is not found. "The journalist reported that on October 22, 1954, at 09:00 p.m., in Scherlenheim, a 15-year-old young man saw a luminous craft from his garden..."
One can see that the text was amputated, so the reader cannot see that this case was explained by the witnesses. There is a link on the word "Scherlenheim", but it points to the old address of my website; so it gives a "page not found" error, and the reader cannot get the trivial explanation. In this book, he reports that Le Nouvel Alsacien for Sunday, October 24, 1954, told that in Scherlenheim, a prank occurred that could have ended tragically. On October 22 at about 9 p.m., a 15-yard-old young man saw from his garden a luminous craft, and ran to get his father's shotgun. What had to happen happened: he fired, and the flying object fell to the ground. The young man then discovered that it was an exploded rubber balloon, with a paper lantern with a wax candle. Scherlenheim is a village in the district of Strasbourg-Campagne, county of Hochfelden. This is a classic case of the old "candle-on-a-stick" prank; which is now referred to as "Chinese lanterns." This is a case ufologist call "a negative case", meaning that the witness himself found the trivial explanation of his sighting. [---] Article in the regional newspaper Le Nouvel Alsacien, France, October 24, 1954. [cv1] "1954, l'Année des OVNIS - en Alsace et dans le Monde", dossier by Christian Valentin, in the quarterly magazine Saisons d'Alsace, Dernières Nouvelles d'Alsace publishers, Strasbourg, France, #23, page 97, summer 2004. [cv2] "Mythes et Réalités des Phénomènes Aériens Non Identifiés - Histoire des soucoupes volantes en Alsace jusqu'en 1980", book by Christian Valentin, Grimoires d'Alsace publishers, France, pp 65-66, 2012. 0.1 Patrick Gross October 9, 2005 First published. 1.1 Patrick Gross February 16, 2014 Additions [my1], [oi1], [id1], and the Summary. 3.1 Patrick Gross February 5, 2015 Addition [cv2]. This page was last updated on February 5, 2015.